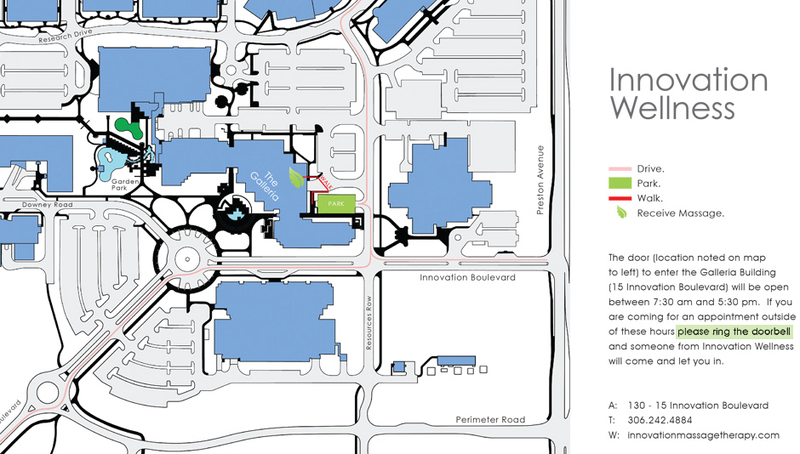 Take Preston Ave to Innovation Blvd take a right turn onto Resources Row and a quick left into Visitor Parking. The doors are located to the right of the 2 loading docks. Take Preston Ave to Research drive. Turn left onto Resources Row and your 3rd right into Visitor Parking. The doors are located to the right of the 2 loading docks. Please view the map for further visual instructions. The doors LOCK at 5:30 and on weekends, your therapist will meet you at the doors. Parking spots are metered parking from 7:30 am to 5:30 pm on weekdays only. * We accept Cash, Cheque and all major Credit Cards except for American Express.